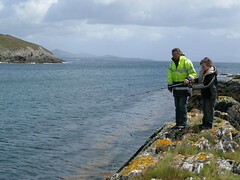 The beautiful scenery of Beara provides an ideal backdrop for sea angling. On Bere Island there are a few different fishing sites that have been recognised. The tourist information centre in Castletownbere 027 70054 can give you more information such as bait grounds. All sites on farmers land will be closed to the public for one day on the 31st January every year. Conserve Bass Daily Bag Limit of 2 Bass per Angler. Size limit is 40cm (15 3/4 inches) Closed Season from 15th May to 15th June. Protected By Law. The tide rises and falls roughly four metres. The low tide is roughly 6 hours and 20 minutes after high tide. Tide tables are available in most shops on the peninsula, these will aid you in determining tide times. Following severe weather conditions, there will be high seas and strong swell and therefore fishing is not recommended. Enquire locally for advice. A weather forecast can be obtained from Weatherdial on 1850-123-850 or check with the tourist office in Castletownbere 027 70054. Care should be taken at all times to avoid accidents as neither the Bere Island Projects Group or the local landowners can be held responsible for any accidents or injuries. When casting make sure everyone knows you are about to cast. Do not swing the lead in any sort of arc. keep it going straight over. rather than throwing them into the fish box.